In the article, a 32-year-old full-time housewife was in her 55th floor apartment in Chuo Ward when the quake struck. She ducked under a table. The swaying lasted for a full five minutes. Terrified, she remained under the table during the subsequent aftershocks while she tried to call her husband, a doctor, and the day care center where her two children were. (M.: “She’s a full-time housewife. Why are her two kids in day care?”) She couldn’t get through to either. About an hour and fifteen minutes after the initial shock she decided to go to the day care center herself to find out if her kids were safe. The elevators, of course, had stopped automatically, so she had to walk down 55 flights of stairs. That’s 180 meters abover the ground. It only took her ten minutes. The day care center is located 3 kilometers from the condo, but every city bus that came by was over-crowded and wouldn’t stop, so she had to walk. It took her 40 minutes, but in the meantime she was able to get through to the school on her cell phone and learned that everything was OK there. She collected her two sons–a 5-year-old and a one-year-old–and brought them back to her building. The three of them waited in the common room on the third floor for the elevators to start operating again. By 7 p.m. her older boy was grumbling that he was hungry, so she walked up 55 flights of stairs, retrieved a strap-on carrier for the baby, and walked back down to the third floor. She put the baby in the carrier and hoisted it on her shoulders, and then took her 5-year-old by the hand and they climbed back up to the 55th floor, stopping every 20 floors to catch their breath. In the only commentary in the piece, the woman said that for once her 5-year-old didn’t complain, obviously awed by the serious of the situation. It took them 30 minutes to reach home. It had been four hours since the first jolt. Since then she has removed everything hanging on the walls. 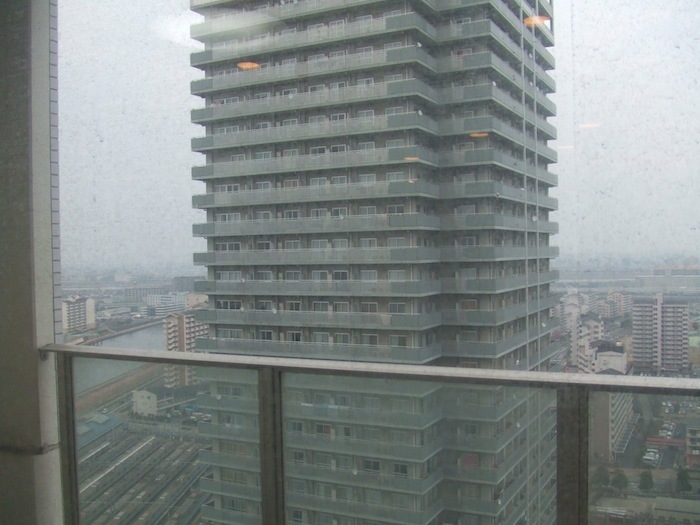 The other story in the article is about an 85-year-old woman who lives on the 24th floor near Mitaka Station. She shares the condo with her son and daughter-in-law but both were out when the quake hit at 2:46. She cowered under the grand piano while kitchenware fell from shelves and glasses broke. All she wanted to do was to “get out,” but, again, the elevator had stopped, so she took the stairs. Despite a bad back and bum knees, she made it to terra firma in what sounds to me like record time for a woman that age: 8 minutes. Once in the lobby the “concierge” served her coffee and lent her a knee warmer. (The perks of high-rise luxury living!) She had to wait until 6:30 when the freight elevator started up again to return to the 24th floor. She says that she has decided that the next time a quake strikes she’ll just sit tight and bear the swaying since her knees can’t take the stairs any more. The rest of the article is mostly reassuring in that it quotes a building superintendent who says that the horrendous creaking that accompanies the swaying in such a building is natural and, in fact, demonstrates that the building is performing according to plan. However, it also mentions another condo owner who says that the earthquake caused cracks to form on her wall, and while she has been assured that these cracks are only cosmetic and not structural in nature, she’ll still have to have them fixed. Of course, the main thing that the article left out was the general feeling of anxiety that lingers after such an experience and the lack of instructions. What about fire? What about loss of electricity, gas, and water? It’s as if everyone who lives in a Tokyo high-rise is a guinea pig in a long-term experiment to find out the viability of such living conditions in an earthquake-prone metropolis. In any case, it will be interesting to see what happens to the high-rise market in the near- and long-term. What about having to walk up tens of floors because the elevators are now out. I know one friend who is having to do this. It seems to go without saying that high-rise life is impossible without working elevators. In my building, the freight elevator was back on in the evening of Mar. 11, and the other elevators were working by the next morning. If there are still high-rises in Tokyo whose elevators are not working (I haven’t heard of any) two weeks after the quake, they are basically uninhabitable. I mean, great exercise, but the effort over the long haul must be really taxing psychologically as well as physically. On a related note, I swear about 12 years ago I read a newspaper article about a study conducted in Japan about the effects of high-rise living on pregnant women. I do not remember the details clearly but according to it, pregnant women living in high-rises are far more likely (6 – 7 times) to suffer from depression and/or complications resulting in miscarriage. The higher up, the worse. I was pretty shocked to read it, but I’ve not heard anything about it since. Have you heard or read of any such study? Hello Phil, freelance journo for the FT here wants to ask you some questions about property. Could you please email me? I think that contemporary high-rise buildings (built in the last 25-years or so) will perform well enough during a severe earthquake depending on their foundations. I would think that it’s the tall poured concrete buildings that will “snap” in anything at 7+. We lived on the 13th floor of a 14 story concrete building for a few months. The smallest tremblor made the building sway side-to-side for what seemed like an eternity. Day care centers’ goal is not to take your children off your hands when you don’t have time with them due to work etc. Their goal is to indoctrinate (read brainwash) the children with certain values and ideologies and barring free independent thought at an early timing.